The Ministry of Petroleum and Energy has offered 29 oil-companies participation in 56 production licenses on the Norwegian Continental Shelf in the Award in Pre-Defined Areas 2016 (APA 2016) licensing round. 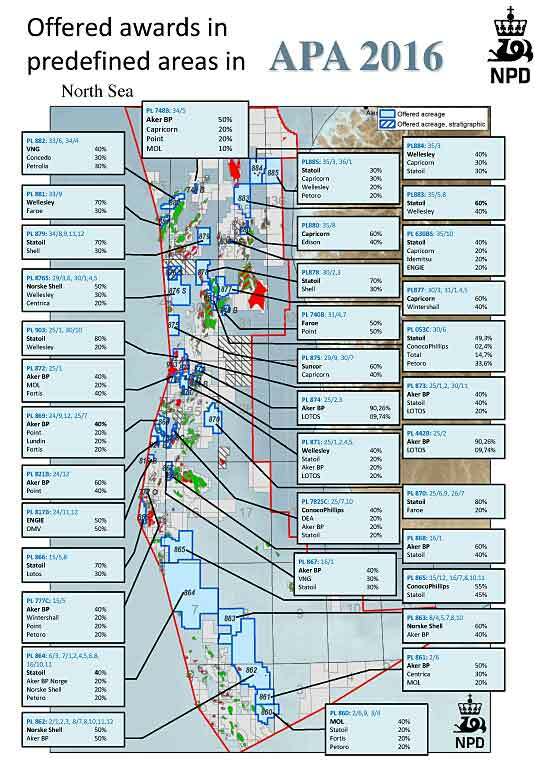 “I am proud to offer a large and diverse group of oil companies participating interests in 56 new production licences in our best known exploration areas. This illustrates how many companies see significant, long-term business-opportunities in the petroleum resources on the Norwegian Continental Shelf, and that this government’s policies work as intended,” says Minister of Petroleum and Energy Terje Søviknes (Progress Party). The 56 exploration licenses are located in the North Sea (36), the Norwegian Sea (17) and the Barents Sea (3). A total of 33 companies applied for production licenses in the APA 2016 licensing round. 29 different oil-companies will be offered awards in one or more license, and 17 of these will be offered one or more operatorships. “A predictable and high level of new acreage awards is a key element of our petroleum policy. The APA 2016 is an important contribution to secure future employment, value creation and state revenues from our by far largest and most important industry,” Minister Søviknes continues. The APA licensing rounds cover the most explored areas on the Norwegian shelf. One of the primary challenges in mature areas is the expected decline in discovery size. Minor discoveries will not be able to support stand-alone developments, but may have good profitability when they can exploit existing and planned processing equipment and transportation systems, or be seen jointly with other discoveries or planned developments. Timely discovery and exploitation of such resources is therefore important. The APA rounds start with an assessment of potential APA-area expansion. For APA 2016, an area-expansion proposal was sent out on public consultation with deadline January 8th 2016. The licensing round was subsequently announced March 17th 2016, with a 6th. of September 2016 application deadline. Once the companies have accepted the offers made to them, final awards will be made by the King in council.